Stanford University has built a digital video wall like no other. 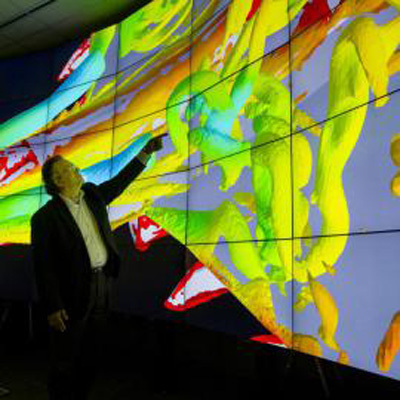 With support from SAP, the university created the HANA Immersive Visualization Environment (HIVE) system. It was set up to accommodate Stanford’s cluster of 30 Linux-based PCs and to allow researchers working at different work stations to push content to the wall. With this impressive video tool, researchers can see, study and solve problems in every realm of knowledge, from biology to cosmology and from engineering to art. The interactive wall, which is open free of charge to all Stanford University students and professors, features a 10 ft. by 24 ft. wide display, with a 13440 x 5400 resolution. It contains 72 million total active pixels. In exploring who would be best to implement the technology for the video wall system, Stanford reviewed several options. The university decided upon CineMassive, a solution provider headquartered in Atlanta, GA, that configures video wall solutions to support critical U.S. military operations. CineMassive created a video display and big data solution tailored to the needs of Stanford University’s extensive list of research programs. CineMassive provided a curved CineView LCD video wall composed of a 7x 5 array of 55″ displays. A multi-HD display canvas was created with the help of an additional column of displays within the CineView structure, fully accommodating the cluster of Linux PCs. Within the HIVE, the viewer feels as if they are in a small move theater. The only difference—rather than having one screen displaying a single image—is that the system has multiple screens that can each be programmed to display different images adjacent to one another. Margot Gerritsen, director of the Institute for Computational and Mathematical Engineering (ICME) and associate professor of energy resources engineering at Stanford, described the necessity for the video wall system in a recent statement. With the help of the CineMassive video wall technology, Stanford researchers have a tool that gives them the ability to collaborate with ease and explore new innovations at previously unheard-of-levels of clarity. They have given the adage of “seeing is believing” an IoT-forward spin, to seeing is understanding. Check out the current research and demos at Stanford HIVE. Learn the basics of CineMassive’s video wall systems and explore its library of visualization technology resources.